We moved north fairly quickly making our way to Washington DC. It’s a long trip up the Potomac River. 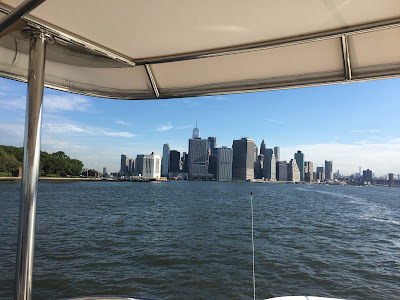 We anchored on the way and the “breakdown” cruise did not disappoint. 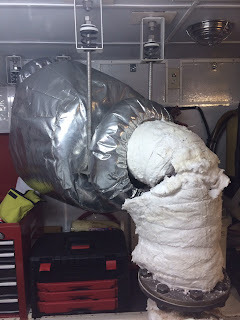 While in Norfolk replaced the washdown pump located just under the forward stateroom bed. 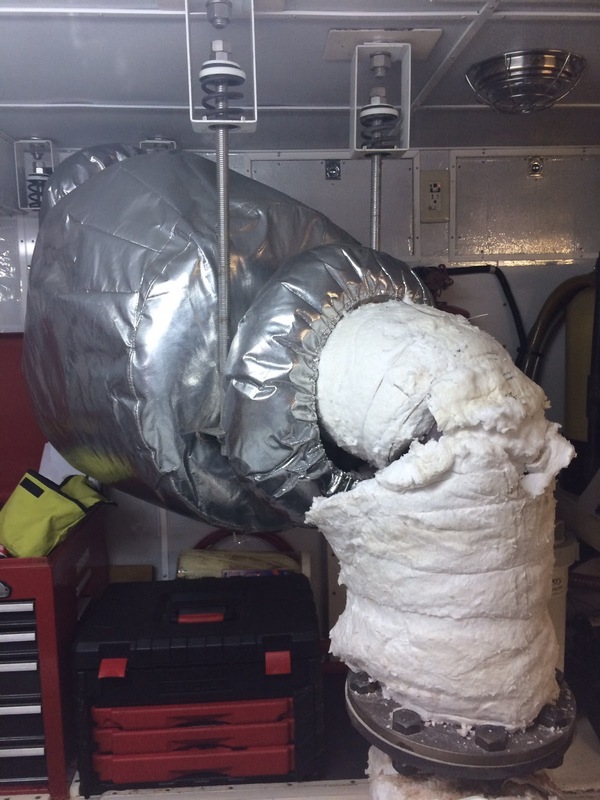 It was leaking slightly and water was making its way onto the stateroom sole. The new pump leaked WORSE! This time the repair included a fabricated catch basin draining to the bilge. Will see how long this pump rebuild lasts. (The picture at the opening of the blog displays the washdown pump capability). While in Washington we got a visit from a financial planner who we have worked with for years. Conservative guy, who dinghied out to us on a mooring ball and saw first hand were we lived and spent our money. Sure he still thinks or is perhaps more convinced we are nuts! 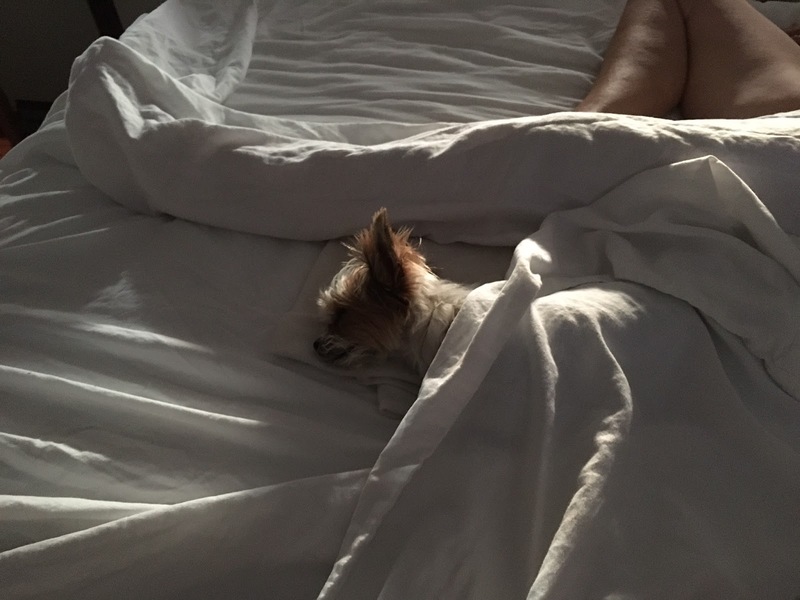 Keela seems to think all is good. Visiting the Holocaust museum was moving and sobering. Man’s inhumanity to man is staggering and on that scale difficult to absorb. Thankful everyday for being born in the USA. A Visit to the museum is a solid reminder not to take it for granted. Every day we enjoyed a flyover by half a dozen or more military helicopters bring congressional leaders to the Capitol. The cruise continued up the Chesapeake Bay, thru the C&D Canal to Cape May NJ. Had to wait on tide to exit Canyon Club. Next stop Atlantic City and then Sandy Hook NJ. 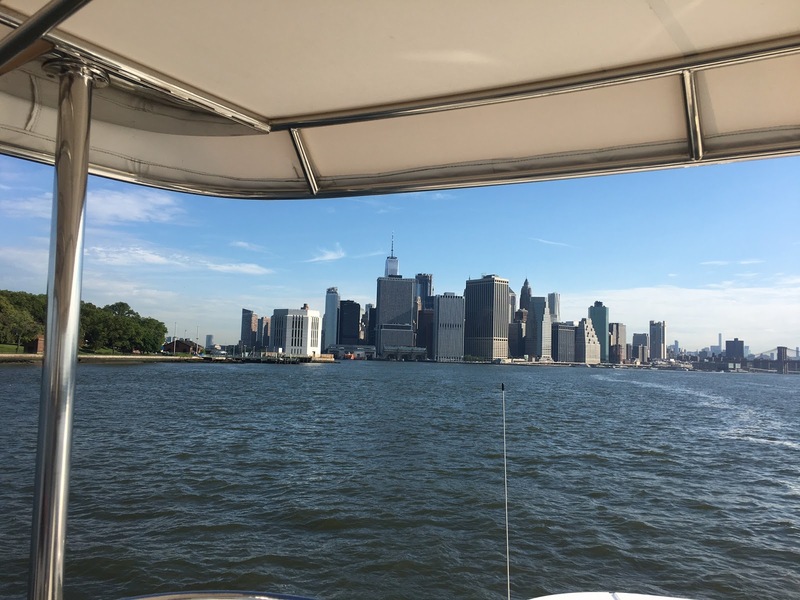 Sandy Hook is a great Anchorage with a view of NY City lights. We were here about 15 years ago on a delivery trip with our 46’ Grand Banks. She was shipped from Florida to Ensenada and became our home for 5 years in San Francisco Bay. Mary, Keela and I continued the run north on the inside. Anchoring just south of Coinjock at Lutz creek we awoke to find the boat covered in bugs. Locals refer to them as “Fuzzy Wags”. Thank heaven they did not bite. They were so thick they clogged the deck drains and left green smudges everywhere. We enjoyed a stop at Coinjock for prime rib and pie. It’s an interesting place made special by the family ownership. 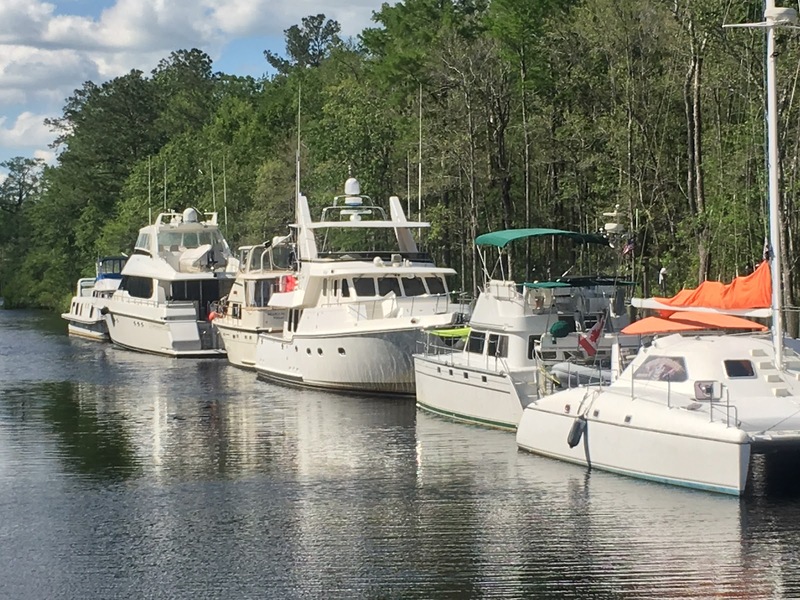 It’s a “wide spot on the ICW” that draws a tremendous number of cruisers each year. 1200’ of dock space often filled wall to wall. Good fuel stop but famous for the prime rib. Land lubbers from all around also flock to the restaurant. Reservations are encouraged and you MUST reserve your prime rib cut ahead of time to be assured it’s available. One of the many highlights of an ICW trip. 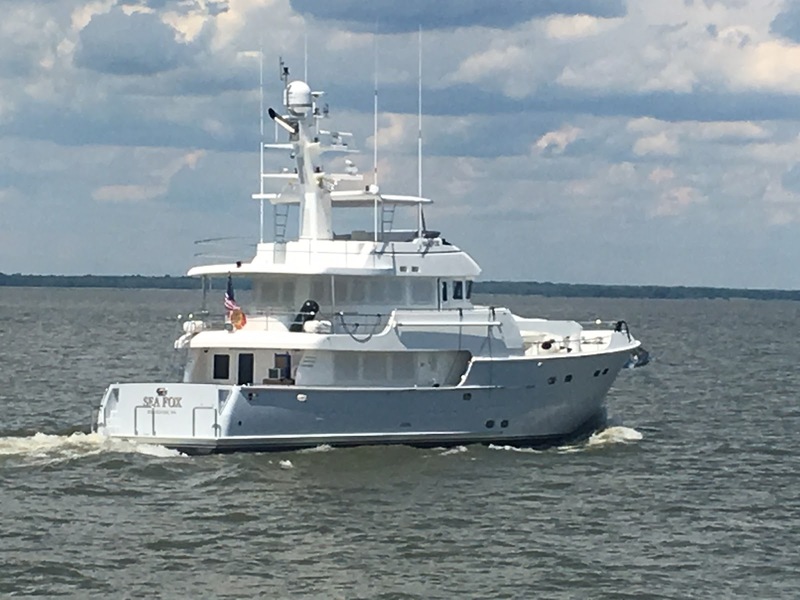 Next stop was Atlantic Yacht Basin in Chesapeake. Established in 1936 it’s a major hurricane hole (we weathered hurricane Mathew aboard a friends N50) and repair center. Well protected with grocery and Restaurants short walk away it’s a great stop. 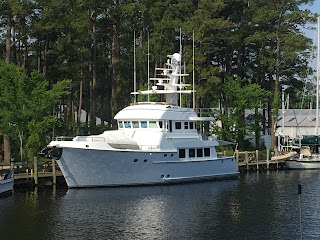 Stayed about 4 weeks and caught up with Dennis and Julie aboard their Nordhavn 76. Mary’s brother Dave and wife Laurie stopped by on their quest to find another boat. Lots of time for repairs at AYB and its a great place since support is available. Engine alignment, exhaust blanket replacement, generator main oil seals, main engine frt. 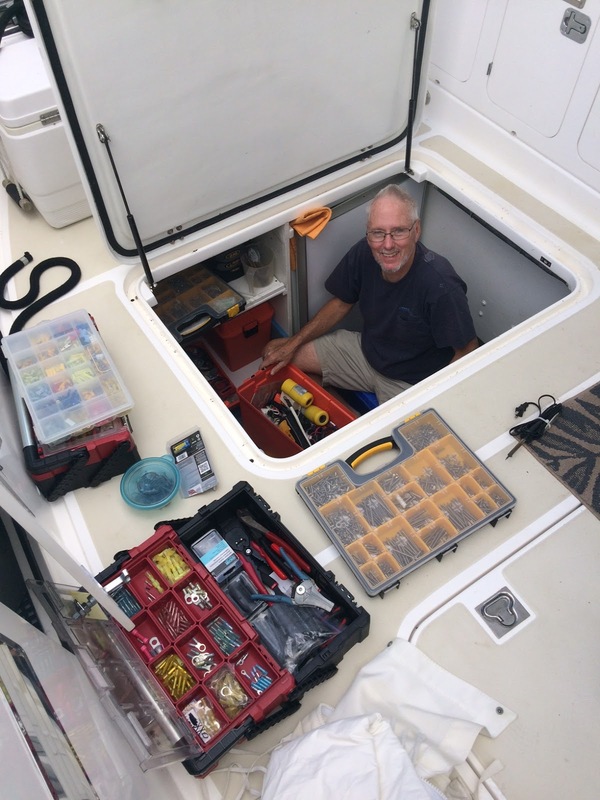 seal to name a few of the tasks...........remember-Cruising is defined as fixing your boat in exotic locations. We left mid June headed to Nova Scotia to join a loosely organized gathering of Nordhavn boats in Nova Scotia. We will be buddy boating with Sea Fox N76 (Dennis & Julie). 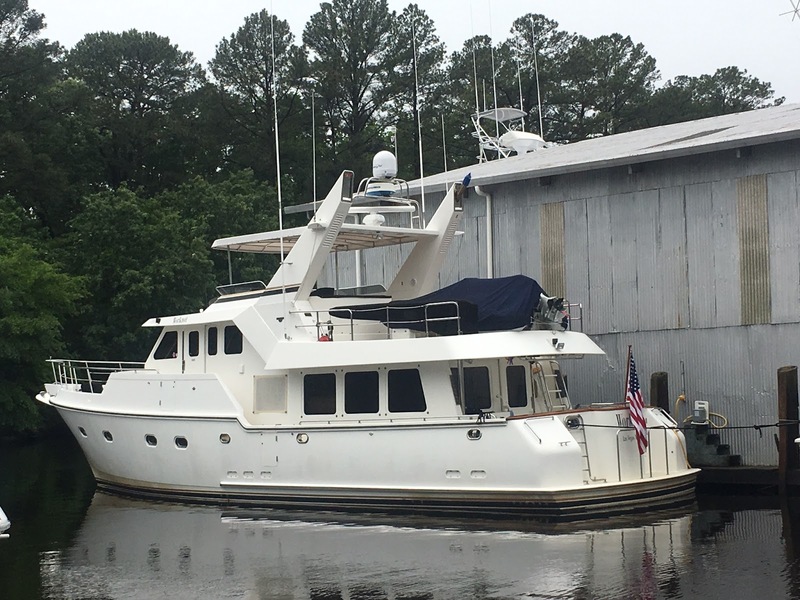 It’s a bold trip to take on a “new to us” boat. Same is true for Dennis so we have named this the “Breakdown Cruise”. 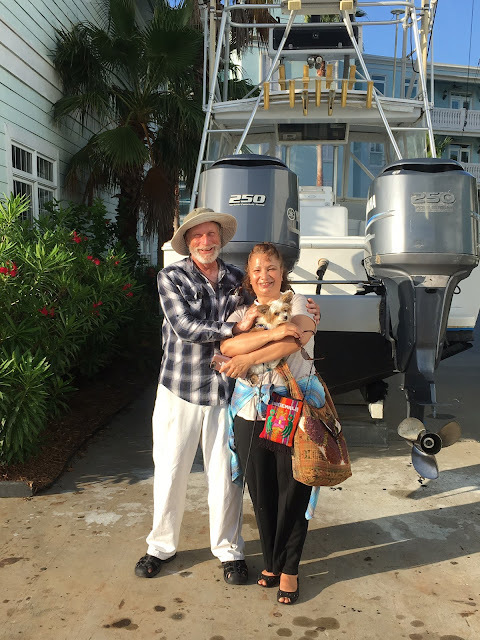 Paul and Irma stayed with us northbound with stops in Vero Beach, Marine Land, and Savannah Ga. Along the way the learning continued ...near Rockhouse Creek we anchored and shut down all the engines only to hear “something running”. 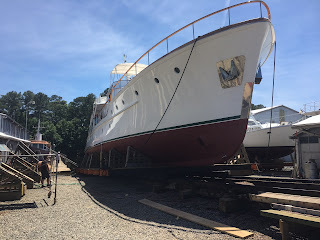 After searching bow to stern and noticing there was no power draw on the electrical panels discovered the sound was from a dredge at least a mile away. It’s discharge pipes ran underwater fairly near our location. If you listen closely can hear the gravel runnng thru the pipes. One our favorite stops is Osprey Marina. They pack us in pretty tight! 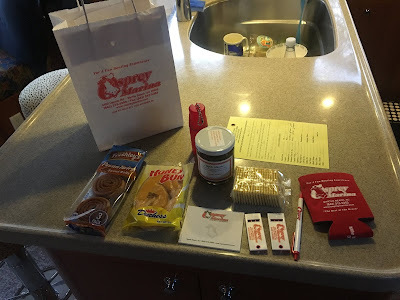 Osprey is known for low cost fuel and one of the best goodie bags on ICW. The contents include a whistle for life jacket, Honey Bun, and more. 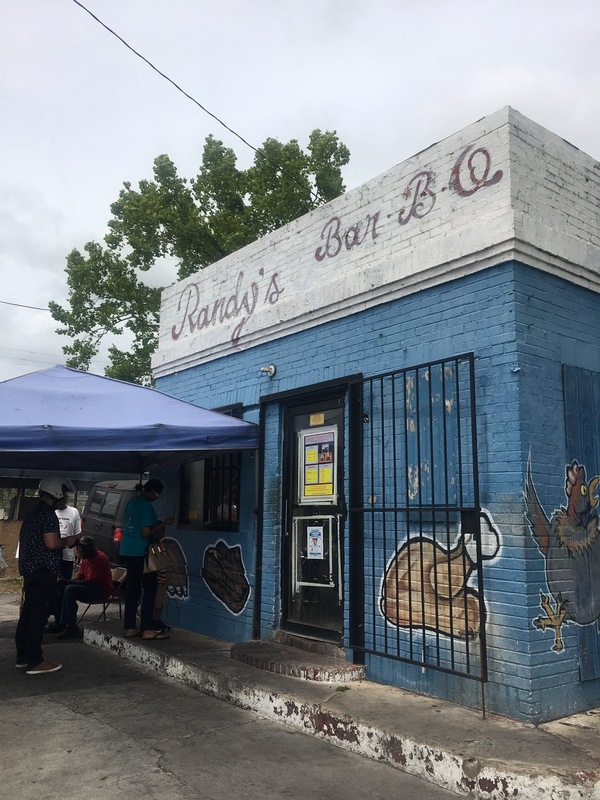 Another favorite is Randy’s BBQ in Savannah. The Uber driver was not crazy about stopping but man was it worthwhile! 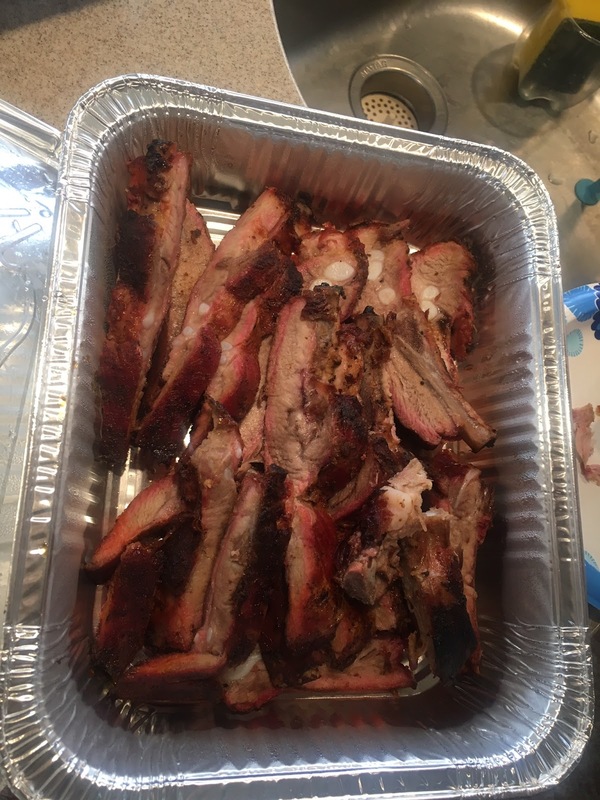 We asked for sauce on the side (we got two of these trays) and we got a milk jug complete with milk lable filled with BBQsauce, properly taped shut with blue painters tape. Friends Paul and Irma, liveaboards from San Diego joined us in a Florida to bring WORKNOT back to Mexico. Irma is from Guatemala, fluent in Spanish, great cook and Paul is a proven cruiser. Provisioning and boat prep continued non stop and we departed for Old Port Cove with plans to leave for the Bahamas and continue south. Keela seems to approve too. 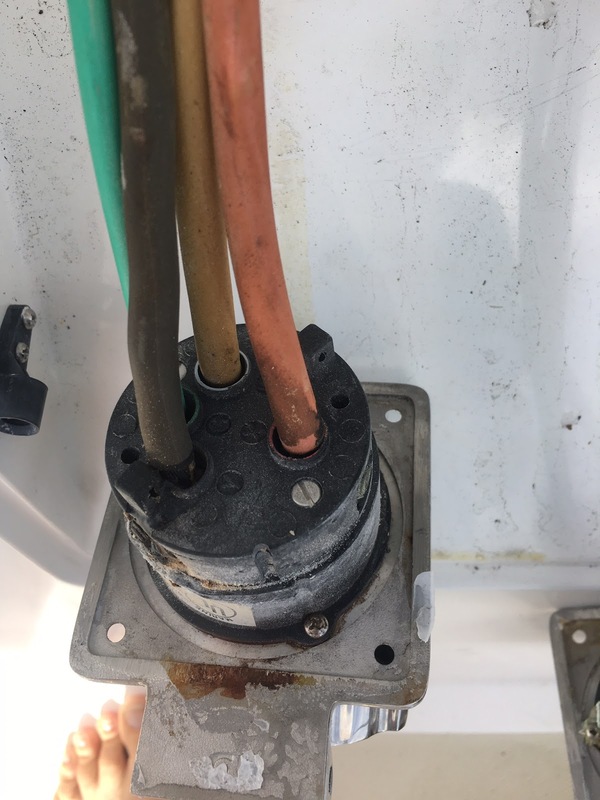 The first year of owning a “new to me” boat is always filled with new problems and new maintenance issues. About 3 AM ( seems to be the boat God’s favorite time) Paul awoke to a burning smell and no air conditioning in the forward cabin. A quick inspection suggested the A/C fan had failed. Daylight revealed a failed shore cord connector. 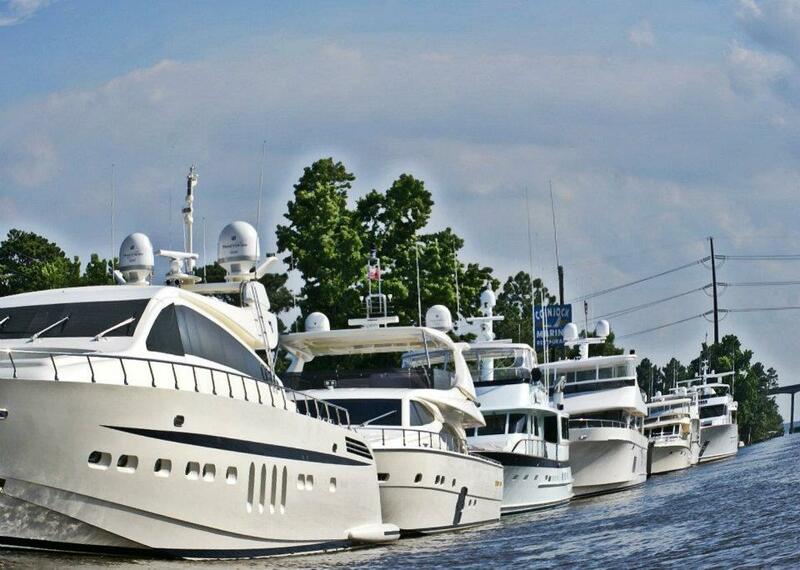 These are the top source of boat fires and marina fires. Along with trying to learn the new layout and systems aboard the “new to me boat” my friend DENNIS provided a great distraction with the “something I want to show you” item. My buddy who was “done boating” took an interest in this. 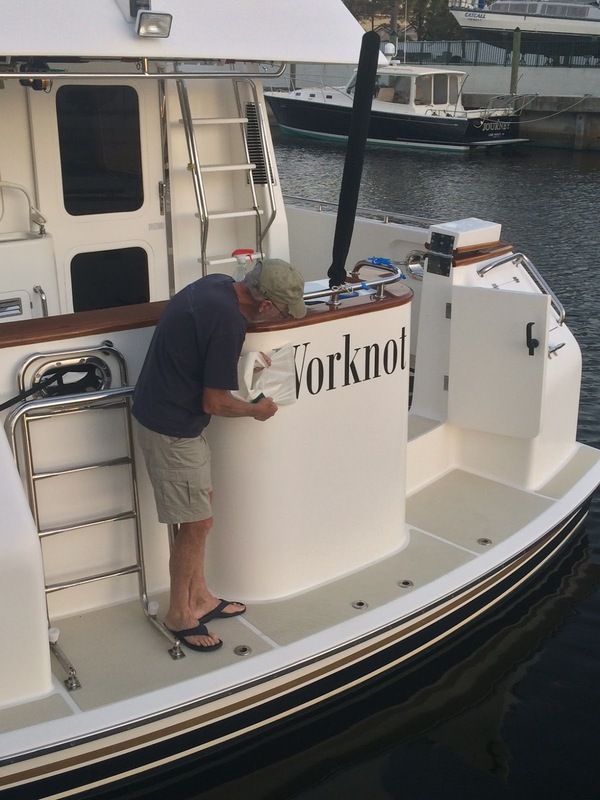 Two weeks later he owns a 76’ Nordhavn. So much for “done boating”. We were both aboard this boat in Mexico on the 2013 FUBAR Ralley. Named Spring Day then it’s a whole other level of boating. Yachting in my view. It’s massive. Weighing well over twice WORKNOT, powered by Detroit 60 Series and drawing over 7’. 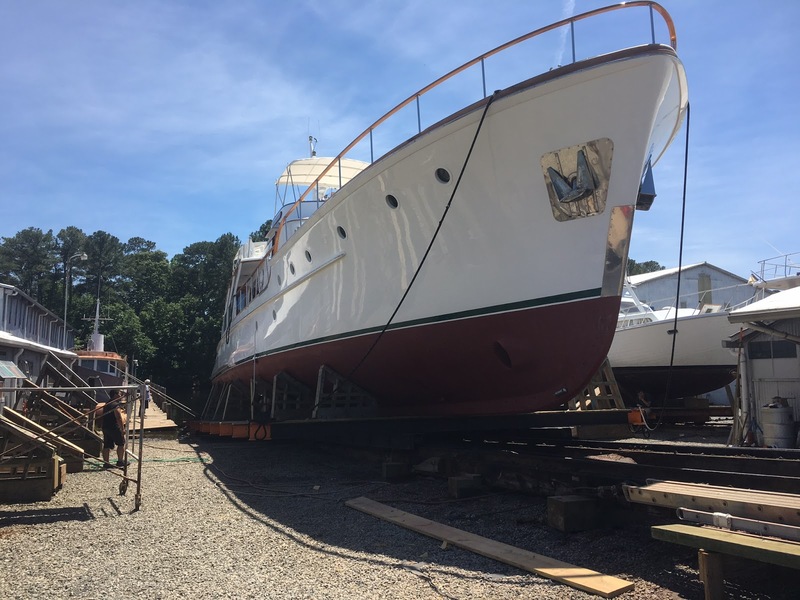 Everything is bigger, lines, fenders, anchors, fuel tank (5,000 gallons) and operating expense. Haulouts are ALWAYS stressful. The entire vessel lifted from its natural habitat by 4 slings. Less than 5% of the hull surface area supporting it all. The minute or so when the boat is half over the water and half over the concrete edge as it’s wheeled to the blocking area. Just writing about it gives me the creeps. 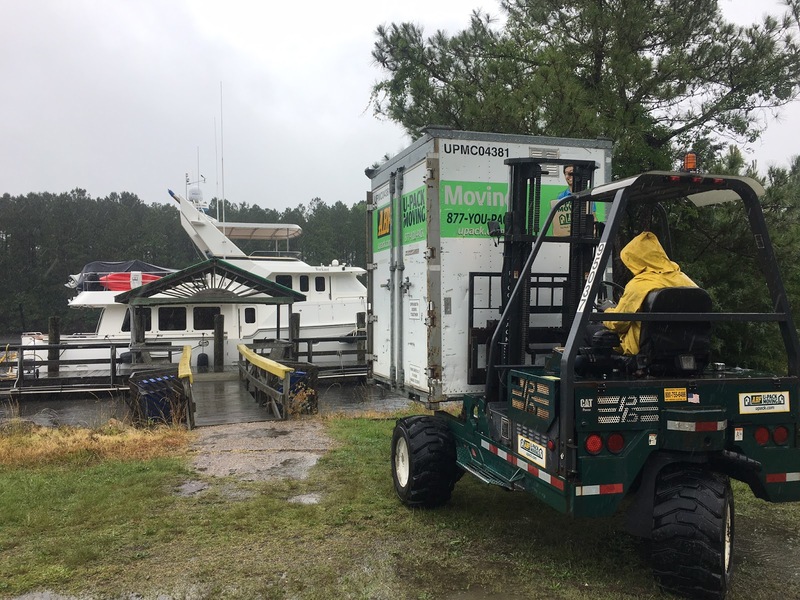 Usually when purchasing boats of this type a survey including out of the water inspection is done by a professional surveyor. Many deals are broken by the disagreements between buyer and seller. A good surveyor finds that balance between the parties and deals work out, some surveyors view their job as proving their worth by finding every defect possible. 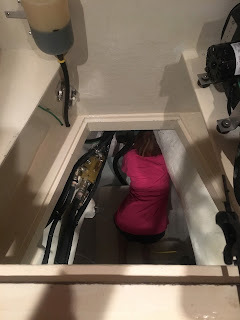 A friend had a $1mm+ boat surveyed for purchase, included in the pages of notes was condemnation of the dinghy anchor light as it was a few inches short of the required height. The light was the installed by the OEM boat builder when the dinghy was new 10 years ago. WORKNOT was not surveyed when I purchased so this was the first time I saw it out of the water. There is plenty to be “wrong” under water. Fortunately no big surprises on this haulout. AND SO IT BEGINS, a “new to me” boat, same age and engine hours as the old one, from the same builder. Today is the first voyage where I’m the Captain and she’s really ours. Have been living aboard with the good friends Dennis and Julie on and off for past month as I shuttle between Mexico (suporting sale of N50) and Old Port Cove Florida preparing N57 to return to Mexico via Panama Canal. 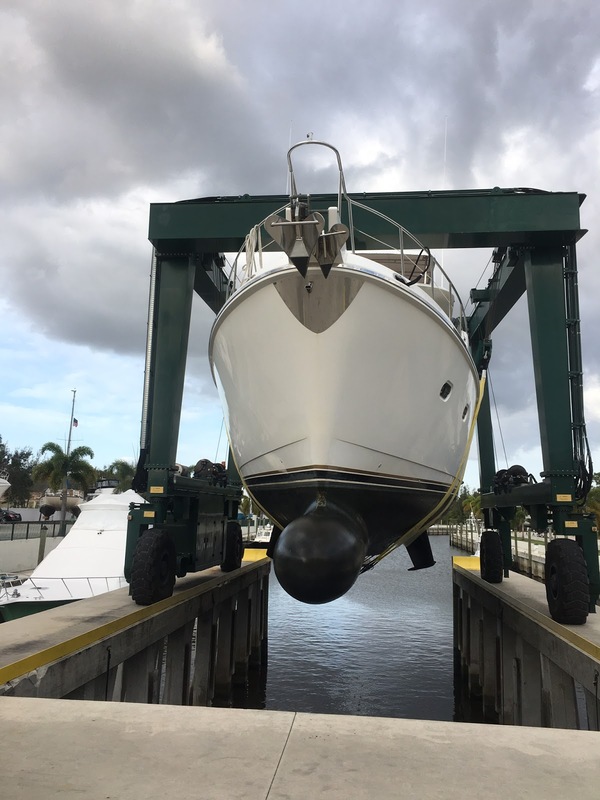 Take a look at the picture on the top of the blog, the water stream is used to washdown the anchor chain. It’s from a large hydraulic driven pump that delivers several hundred gallons an hour of seawater. Testing this in the dock at Old Port Cove almost got us evicted. WORKNOT was clearly on the small range of boats at this West Palm resort and the big boys do NOT appreciate saltwater blown completely across the dock, across their power pedestal and half way up the side of their boat. 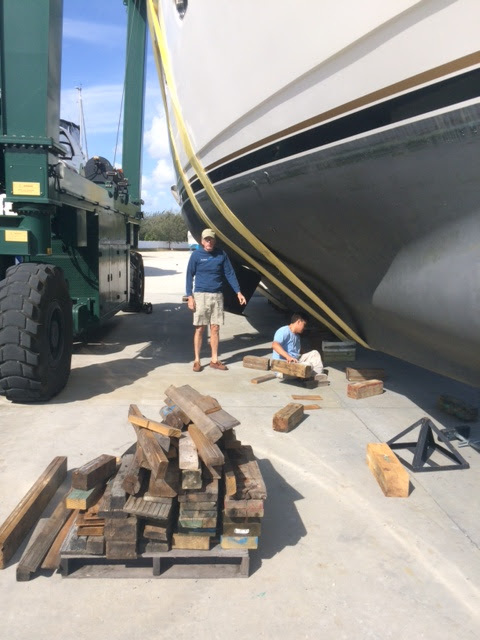 Getting a boat ready to cruise is all about mechanical prep and loading supplies including spares. Dennis sold us the boat declaring “is my last boat” (keep that thought as it recurs often) and so all the onboard spares, tools and the contents of his 20yr+ storage locker came with the boat. Just sorting out stainless hardware is a job. The journey to the boatyard was only a few hours but it included a lock and a few narrow bridges. Great way to start the maiden voyage. 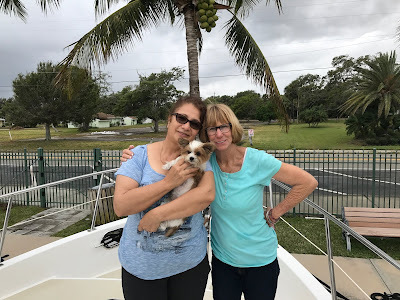 Reached River Forest boatyard without any major errors where I said goodbye to Julie and Dennis as they were leaving to go find a condo on the west coast of Florida.